When I finish bonnets they usually spark an “Oooo” or a “yeah” or some wordy expression. This one, goes on its stand and just gets a smile. I am so pleased with how this came together, I just enjoy looking at it. This was a custom piece for a client. For many weeks we picked through silk colors, ribbons and flowers to get just the right combination. The straw brim is a black plait from England. 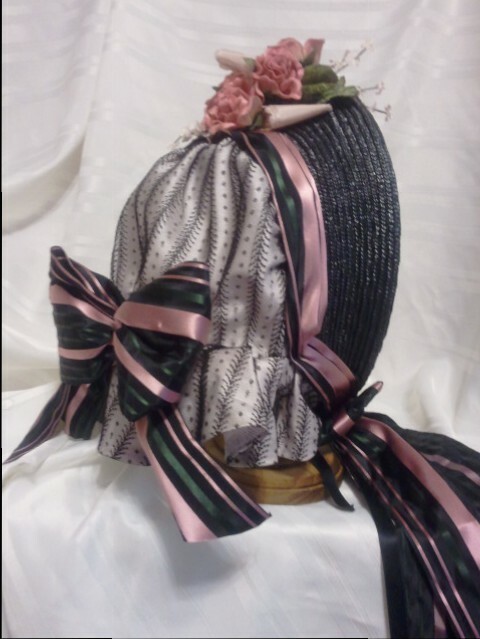 The soft crown and bavolet are a combination of a pale pink silk taffeta and a beautiful, delicate black antique lace. The soft crown has the stripes of the lace running vertically, while the stripes on the bavolet are running diagonally, bias-esque. 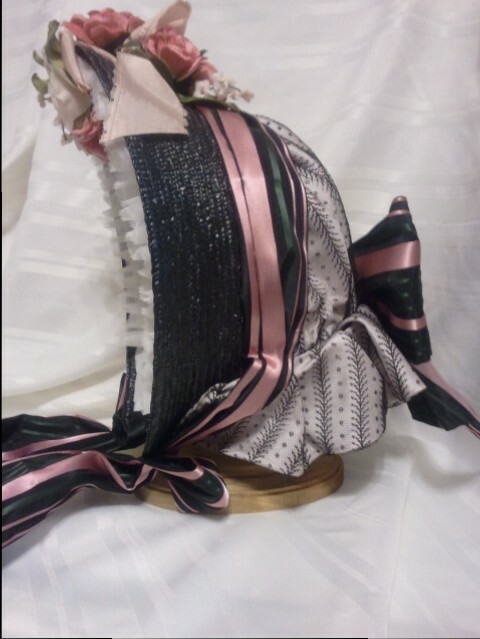 An amazing ribbon drapes over the top of the bonnet along where the brim and crown meet, then down the cheektabs for the ties. 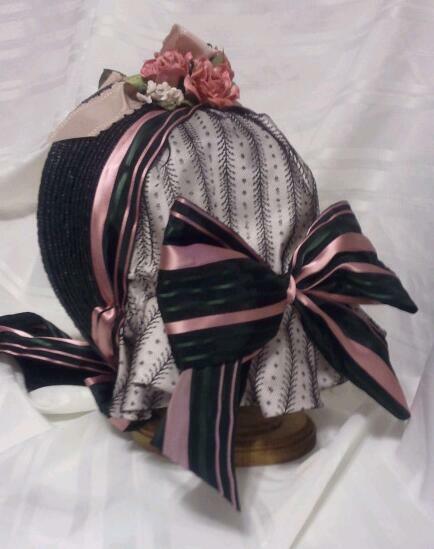 This ribbon is a black taffeta with pink and dark green satin stripes. A large bow of this same ribbon sits at the base of the crown, just above the bavolet. 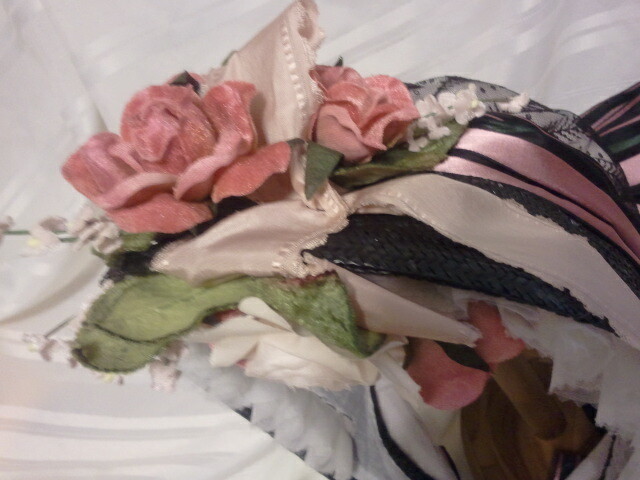 Combined with the pink damask ribbon in the flowers, there are nearly 5 yards of ribbon on this bonnet. The flowers are a combination of dusty rose and pink velvet roses with a pale pink rose and little pink velvet blossoms. 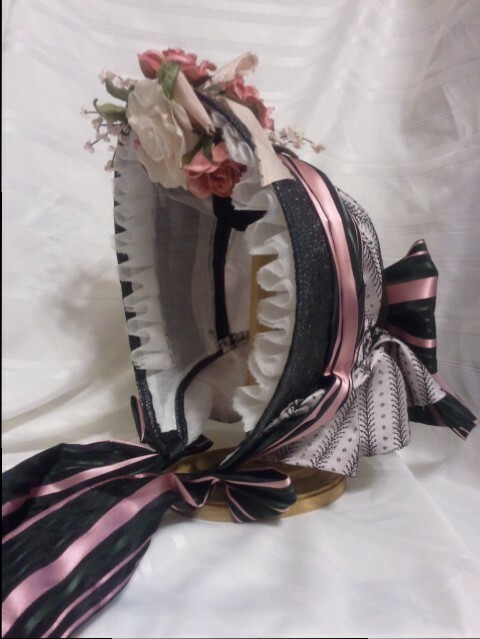 The arrangement inside the brim is connected to the bouquet atop the brim by a soft pink damask ribbon that winds in and out of the flowers. Getting the right balance was important to me. Too much weight in the back makes a bonnet slide; while too much weight in the front makes a bonnet feel heavy. I think this balances pretty well with the bow and flowers counter weighting each other. So, it is pretty and balanced. Happy me. Beautiful plait and ribbon. The whole effect is lovely.